As some of you might recall, years ago I worked for Wolfgang Puck at the original Spago Restaurant in West Hollywood. Thru the years, I’ve continued to enjoy Wolf’s restaurants, and I’m happy to say that his newest concept serving global fare in a family-style format does not disappoint. Inspired by how Wolf dines and entertains at home, the menu at the new WP Kitchen & Bar in Palm Desert consists of seasonal offerings of small plates, fresh salads, pizzas, handmade pasta as well as steak and seafood. On our visit, my husband Bill and I were lucky enough to see Klaus Puck, Wolfgang’s brother at the helm. He was greeting the customers, expediting the food and making sure that everything was running smoothly. Truly hands on and it shows. We started with a delicious Smoked Salmon Bruschetta, which has the best Horseradish Cream that they smoke at Spago, along with Watercress, Apples, Radish and Pumpkin Seeds. Klaus then treated us to a Lobster Knuckle Sandwich that has a taste-tingling mix of Vadouvan spices that are truly addicting. Next was the Arancini with Wild Mushrooms and a Garlic Aioli. Little Italian balls of joy! For our next course, I had Agnolotti filled with Pumpkin in a Sage Brown Butter sauce dusted with Pecorino and finished with fried Sage. I could eat this dish every day and not get tired of it. Bill enjoyed the Braised Beef Short Rib in Moroccan Spices with Dried Fruit, Toasted Almonds and Couscous. It was falling off the bone, and the spices were spot on. 2 Desserts Are Better Than 1! By this point, we were stuffed but Klaus’ generosity knew no bounds, and we enjoyed two desserts; the Apple Tart and Salted Caramel Pudding with Crème Fraiche Whipped Cream and Brown Sugar. We can’t wait to go back and are very happy to have this new addition to the desert dining scene. WP Kitchen has a nice wine list and Happy Hour Menu and is open seven days a week from 11 AM until close with Happy Hour Daily from 3-6PM. Please say hello to Klaus Puck if he's there and tell him that Sheri Dettman sent you. 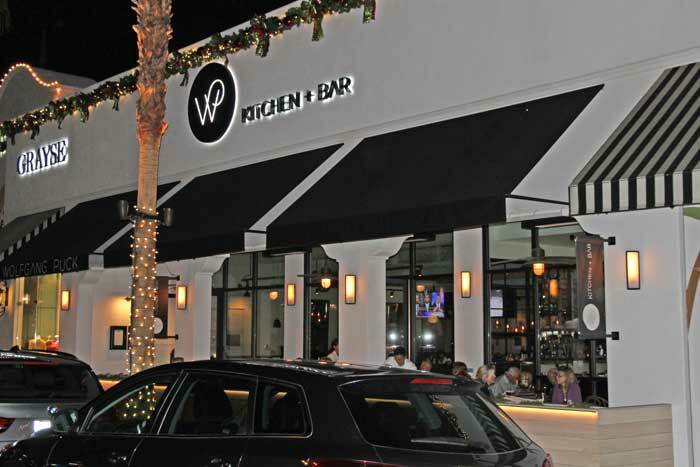 WP Kitchen & Bar: 73-130 El Paseo, Palm Desert, CA 92260 (760) 568-2700.